Dog bite injuries are often very serious and are becoming more and more common. If you or someone you love has been injured as a result of a dog bite or other animal attack, an experienced personal injury lawyer can explain your rights, answer your questions and help you pursue compensation. In California, dog owners are liable for the damage caused by their dogs. In a dog bite case, two questions need to be asked: (1) who owned the dog? and (2) did the owner have some kind of liability insurance coverage? Many people do not understand that homeowner’s or renter’s insurance policies not only cover events that happen in the home but may also cover things that happen while away from the home, including harm caused by the homeowner’s or renter’s dog. So it is essential that you consult with an attorney to confirm insurance coverage. Dog bite cases can involve any breed, from large, aggressive dogs to smaller dogs, and often result in serious injuries, scarring and other disfigurement. In fact, depending upon the magnitude of the injury, a significant aspect of the damage claim may be for a residual scar of one kind or another. No matter the situation, we work hard to secure the compensation to which our client is entitled including damages for pain and suffering and past and future medical care. Dog bite cases have important statutes of limitation that must be complied with in order to protect your rights. Don’t let this important deadline pass, call Iler & Iler, LLP today. 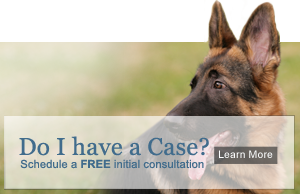 We have handled numerous dog bite cases over the years, representing both adults and minors injured by dog bites. We represent clients on a contingency fee basis, meaning there is no upfront cost for the claim and we get paid only if we win or settle your case. Write a detailed description of the attack How did it happen? Where did it happen? Ask around, has anyone else had problems with this dog before?